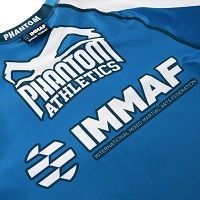 PHANTOM MMA, IMMAF APPROVED PRODUCTS, PHANTOM. 87% Polyester - 13% Spandex: Fabric known for its elasticity and strength. Compression Technology: improves your blood circulation to the muscles and speeds up your recovery time. Dry Tech technology: provides better moisture management. 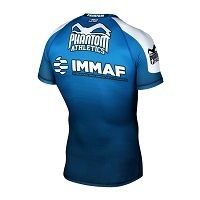 Impressions sublimated into the fiber for maximum durability. Fitted cut leaving no outlet to your opponent. reinforced seams. Rubber band located at waist for keeping your rashguard the right place for a perfect coverage of your body during the fight. 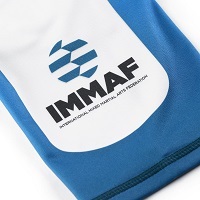 Certified by the International Mixed Martial Arts Federation. Colours Available: Blue & White, Black & Blue. Sizes Available: XS, S, M, L, XL, XXL.